For anyone wondering why I haven't been updating much lately, it's because most of my non-day job, non-freelancer cycles have been occupied with this puppy: The Comic Book Guide to the Mission. 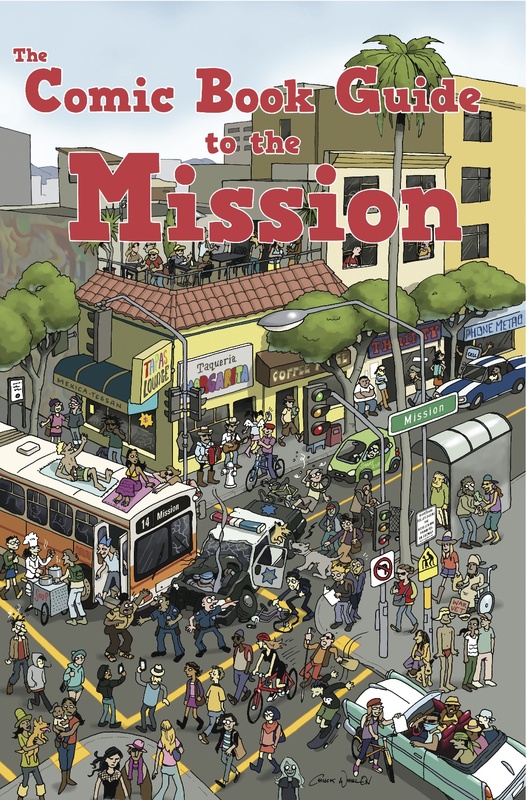 It's a comics anthology about San Francisco's Mission District featuring a number of extremely talented people (including a few Bay Area-based webcomickers) that I have been collecting and editing for the past year -- and is now finally available! 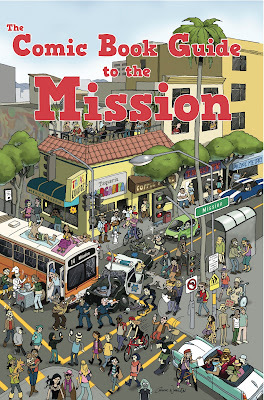 If you're in the Bay Area, I encourage you to check out The Comic Book Guide to the Mission at your local retailer. Other folks can purchase them directly from me at Skoda Man Press. The book is also being distributed through Last Gasp if you know a retailer (or are a retailer) who might be interested in carrying the book. Love that cover? Me too. It's by Chuck Whelon of Pewfell fame. Featuring: Sean Chiki (Wunderkammer), Jamaica Dyer (Weird Fishes), Andrew Farago (The Cartoon Art Museum, William Bazillion), Shaenon K. Garrity (Narbonic, Skin Horse), Justin Hall (All Thumbs Press, True Travel Tales, Glamazonia), Mario Hernandez (Love and Rockets, Citizen Rex), Greg Hinkle, Nomi Kane (Chutzpah! ), Jonas Madden-Connor (Ochre Ellipse), Paul Madonna (All Over Coffee), Omar Mamoon (The Mission: Taco), Amy Martin (Bachelor Girl, The Single Girls), John Mathis, Aindrila Mukhopadhyay, Roman Muradov (Sad Comics), Jen Oaks, Ariel Schrag (Potential, Likewise, Ariel and Kevin Invade Everything), Matt Stewart (The French Revolution), Alfred Twu (First Cultural Industries), Dan V. (American Objects), Geoff Vasile (Trackrabbit), Jeff Walker, Mike White (Amity Blamity), Clint Woods (Fernetiquette), and Rick Worley (A Waste of Time). A lot of women, particularly individuals who wish to possess lengthier locks as quickly as possible, are selecting locks plug-ins. brazilian hair This particular uprise within recognition offers inspired several elegance stores to give stunning B razil locks available, providing females enable you to achieve a brand new appear. brazilian hair uk Nevertheless, plenty of shorthaired females are afraid to test locks plug-ins, as numerous possess myths how actual these people appear, while some tend to be unclear in the event that plug-ins tend to be risk-free with regard to daily put on. brazilian hair sale Listed here are 2 powerful factors locks plug-ins tend to be secure as well as ways to obtain 1 on your own. At first, observe that locks plug-ins aren't long-term replacements with regard to real locks. I really like the topic of this post that us really very suitable for my rush essay discount and i like the painting on this page anyway i appreciate this writer for interesting writing style and different point of view. Witchcraft had once been widely used before cursed by the society. Excel Amazing article thanks or sharing.. Stunning artwork! Thank you for sharing!